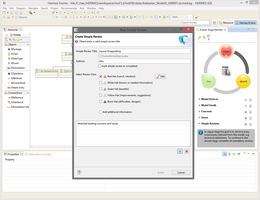 If you would like to install our prototype, we recommend to use Eclipse Kepler Modeling Tools Environment as a basis. Then, install our updatesite (HERMES) and install the parts you need. Mind that every plugin, fragment, and feature is installed as a binary and as a source bundle. This exposes the implementation details as you need it. The 3rd party update site is not needed in general. 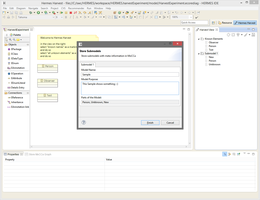 This video shows the basic functionality how models can be stored into a model library. The process takes "known" parts into account and links them to the newly stored. This video shows how the evolution approach assesses model quality and offers a staged approach that guides model quality. This video shows how models can be "applied", i.e., reused. 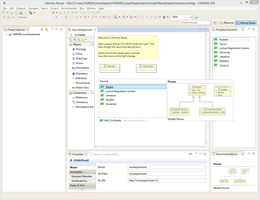 They are loaded from a model library and inserted into the open editor. Several libraries and several editors are supported.